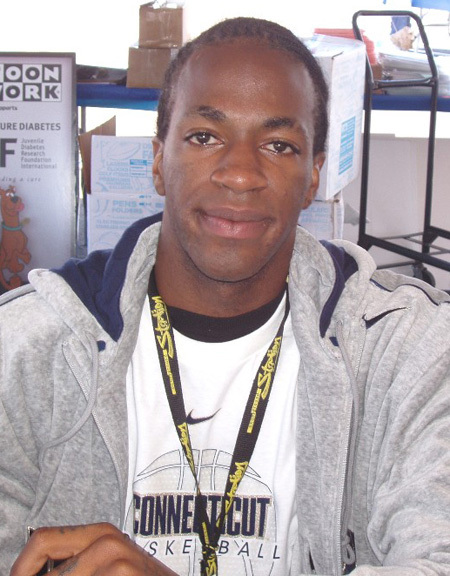 Stanley Robinson was a Forward for the UConn Huskies from 2006 – 2010. He played a key role in the National Collegiate Athletic Association (NCAA) Tournament when UConn reached the Final Four. Stanley also enjoyed a 34 game streak of scoring in double figures. In the 2010 National Basketball Association (NBA) Draft Stanley was selected as the 59th pick by the Orlando Magic. In August of 2010 I had the pleasure of talking to Stanley about his unique UConn experience. When talking about his high school memories Stanley said, “One of many memories was taking my team (Huffman High School in Birmingham, Alabama) to the state championship game. We lost, but I was happy to be there.” As a senior, Stanley was named Mr. Basketball in Birmingham. His compiled stats at Huffman were over 2,000 points scored, just under 1,000 rebounds, over 500 assists, 250 steals and 300 blocked shots. The transition from high school to college was difficult. “In high school we ran specific plays but in college if you have an open shot, you have to take it. I wasn’t used to it.” Other than basketball Stanley had to adjust to the cold Connecticut weather from the warm Alabama weather which was a challenge but thinks he adapted pretty well. 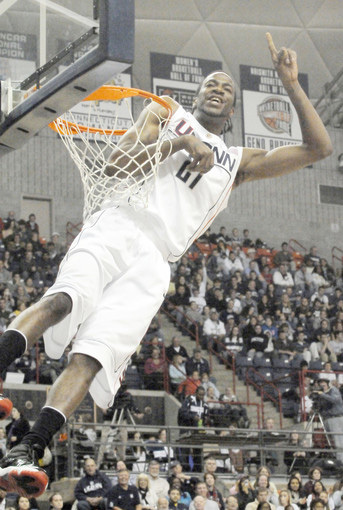 Stanley’s time at UConn was like no one before him. His freshman year was pretty good. He played in every game with solid contributions. He had a few double figure games and his first career double-double game. As a sophomore again he played in all games and in the starting lineup all games but one. At the end of his sophomore season he was suspended from the team for what Coach Calhoun referred to as a desperate need to grow up. Stanley had not been focused. He was late to practice and skipping classes. Stanley was only age 17 when he enrolled at UConn, he was homesick, avoided media interviews and missed his two daughters in Alabama. Coach Calhoun gave Stanley two choices, go back to Alabama or stay in Connecticut get a job and earn his way back to the team. Soon Stanley was working at Prime Materials, Inc. a factory in Willimantic, Connecticut filling boxes with scrap metal only to have another box waiting to be filled, for eight hours a day. He couldn’t practice with the team but continued working on his game before and after work. He was responsible to pay for his own apartment, food and utilities and save money to be able to pay his tuition for classes the following semester. He would be a walk-on player on the team without a scholarship, and try to earn his scholarship back for the following year. Stanley has two daughters Kamilah, age 5 and Kelsi, age 3.